BEVERLY HILS, Calif. (AP) — The sunny musical “La La Land” may have danced its way to a Golden Globes record Sunday night, but the film’s seven accolades were a mere sideshow to the eloquence of honoree Meryl Streep, whose speech encapsulated the evening’s prevailing themes of hope, inclusivity and action over anger about the imminent presidency of Donald Trump. Without even mentioning Trump by name, Streep, in accepting the year’s Cecil B. DeMille Award, eviscerated the President-elect’s use of his power and rank in the mocking of a disabled New York Times reporter on the campaign trail this year. 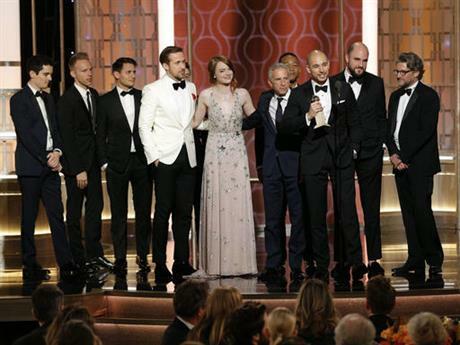 Emma Stone, Ryan Gosling and Damien Chazelle all spoke of the film’s hopeful message of pursuing dreams despite obstacles. The escapism of “La La Land” was contrasted with the realism of Barry Jenkins’ coming-of-age drama “Moonlight,” which won its only award of the night for best motion picture drama, possibly foreshadowing an ideological showdown between the two very different films at the Oscars, whose nominations are announced on Jan. 24. While “Moonlight” didn’t shine as brightly as expected at the Globes, just one year after a second-straight season of OscarsSoWhite protests, the night was notable for the widespread diversity of its winners, in film and TV. Donald Glover’s “Atlanta” won best comedy series over heavyweights like “Veep” and “Transparent” and later added best actor in a comedy. “I really want to thank Atlanta and all the black folks in Atlanta,” said a stunned-looking Glover. “I want you to know that I see you, we see you,” said Ross, who was the first black woman to win in the category since Debbie Allen in 1982. Backstage, however was a different story. Davis, for one, wondered what Trump’s Presidency says about Americans. Dutch director Paul Verhoeven, whose controversial “Elle” won best foreign language film and a best actress in a drama award for star Isabelle Huppert, said that he’s very scared for the presidency. In an evening of such inclusiveness, there was a glaring flub made twice on Sunday that had nothing to do with a malfunctioning teleprompter. Both red carpet reporter Jenna Bush Hager and then Michael Keaton during the show both mistakenly called the NASA film “Hidden Figures,” ”Hidden Fences.” It quickly became a popular, if dismaying, joke on social media. In television, as expected, “The People v. O.J. Simpson” took best miniseries, as well as an award for Sarah Paulson. And Netflix’s Elizabeth II series “The Crown” won both best drama series and best actress in a drama series for Claire Foy. The ceremony included a memorial reel, which was added following the recent deaths of Debbie Reynolds and Carrie Fisher, who were laid to rest Friday in Los Angeles. Streep quoted the latter to end her speech.